One bad thing about growing older is that the number of people you have always looked up to as mentors and role models grows smaller and there are fewer of them around as time goes by. This week saw another lifelong mentor of mine depart after several years of declining health and I couldn’t help but think that whereas I had lost a mentor and a friend, my community had lost a champion and a community leader who blazed quite a few trails over her 91 year long life and especially during the past 60 years since she and her husband moved here. Kathleen Pinckney was an educated woman, earning a college degree at a time when far fewer women attended college than do today. She not only believed in education, she lived and breathed it, investing her knowledge, not just in her own four children but in hundreds of young people who crossed her path over the years. Her career as an educator and as a leader in 4-H was a big part of who she was but I think her career was only the facilitator towards her becoming the much-admired example of a community leader that she truly was. Miss Kathleen may not have been born in this community but from pretty much the moment she got here over six decades ago, she embraced it and invested everything she had in it, including her time, her knowledge and her personal power. She didn’t just invest though…she pushed. She pushed others to be community leaders and she championed them on to success and then at some point along the way, she began to push me too. I don’t know exactly when she first started to push me but I do remember the moment when she challenged me to go and make something of myself. Quite a powerful title for a book, wouldn’t you agree? As I said, it wasn’t a big book and for someone like me who consumed them, it was one that I could probably read in an hour….except one can’t read that particular book in an hour and hope to digest all the motivation, inspiration and advice contained within it. It is a book you have to read slowly and pause along the way to think about what was written. I read the book, taking my time to grasp the messages and to feel the motive power in them. Miss Kathleen had just given me one of the keys to a more fulfilling and challenging life. Inside the cover, written in a fine hand, was a personal message from her that I treasure to this day. Honestly, for a long time before I got that book, I wasn’t sure whether she even liked me or not and suddenly here she was….pushing me. She had thrown down the gauntlet and dared me to do better, to do more, to give more, to be more. Against such a force of personality I did not have a chance. Neither did anyone else she took an interest in. Over the next 25 years, Miss Kathleen became one of my strongest supporters and I became one of her biggest fans. She championed the needs of the community, from the poor, to the uneducated and to the disabled and she made a difference in the things that she did, yet she still found time to “push” others to make a difference too and not just to follow her causes but to find our own. If she saw a need, she jumped right in and did whatever was necessary to address that need. Years before I came along, she was active in the community and its organizations. She was a faithful member of the Daughters of The American Revolution and was one of the four charter organizers of the Girl Scouts of Butts County. Both of these organizations were important to her, one recognizing our history and our past, the other preparing young girls to be future leaders in the community. She appreciated history but always kept her eyes looking forward to things that would come and worked to prepare those that would someday be needed to meet the challenges down the road. Miss Kathleen was an active leader in church and it was there that I frequently came under her influence for she always pushed me to be active in church, enjoyed when I sang in the choir, was always glad to hear me preach a sermon and encouraged me in my work as a worship leader. She and her husband Robert have always been actively involved in the mission of the church and gave freely of their time towards helping the church in any way possible. I have missed seeing her in the congregation over the past few years as illness kept her from attending but I always knew her heart was there even if her physical presence could not be. I do remember one of the last times I got to have a good conversation with her and that was when she received the capstone of her long career in community service, induction into the Chamber of Commerce Hall of Fame, the community’s highest honor. I had served that year on the nominating committee and when her name was brought up for consideration, there was no one more deserving of it than her. It was to be the last of a significant and long string of awards and accolades bestowed on her by a grateful community over many years, a community who appreciated all she had done to make the town she loved a better place for everyone. Many of my generation and my parent’s generation have felt the influence she had on them and at least in my case, have benefitted greatly from it. She gave me a book that challenged me to look within myself and find something substantial and build on that. She dared me to succeed and she encouraged me for as long as she was able to keep pushing myself , even when she wasn’t there doing it herself. As children, we sometimes do things on a dare that we normally wouldn’t do. As adults, we sometimes abandon reason and sense because we are dared to do something that prudent judgment says we shouldn’t do. 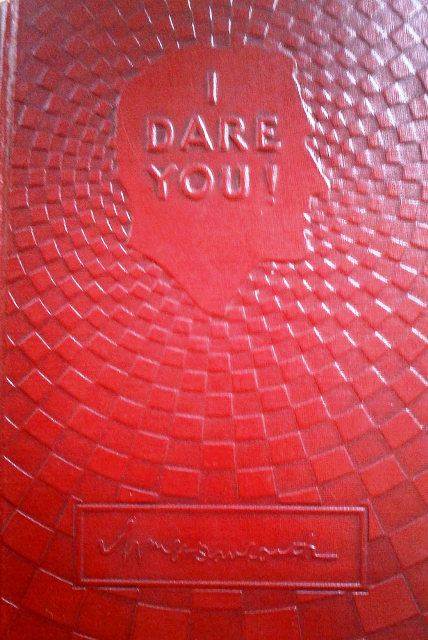 Miss Kathleen knew the power of a dare but she also knew that it could be used in a positive way that would produce positive results. Rather than saying hurtful words to the children she influenced, things like “You won’t ever amount to anything”, she instead dared us to amount to something and she didn’t just throw that out there and walk away. She encouraged, she pushed, she praised, she congratulated and then she would push some more. Written in the cover of a book given to me many years ago are the words “I expect great things from you”. Thank you, Miss Kathleen, for your example and your wisdom….and for daring me to do more than I ever thought I could. I’m glad to know I’m not the only one she influenced but then we already knew that-still, everyone was special to her and we each had unique experiences and perspectives with her. Thanks for the comments! I throw away a lot of “collectibles” and other gift items that over the years build up from a career in education. When I heard the news that Kathleen passed away, I walked over and picked up a small dish in the shape of a seashell that was given to me in 1985 as a token of appreciation by Kathleen and the DAR for having my students participate in their essay contest for sixth graders. Why have I kept it all these years? I have it because I moved to Jackson knowing no one other than my roommate. Ladies like Kathleen, Mary Carr and many others took me under their capable and caring wings and taught me to fly. From a raw, green and naive new teacher, they showed me what I could and should be as a teacher. Thank you Mrs. Pinckney. Thank you Michael for this beautifully written piece. A moving tribute. Were that there were more Kathleen Pinckneys in the world today.